Does a relic that has always been inanimate have any less importance than a relic that once was living? True, the mind is filled with old tiles on which are engraved the faces of past acquaintances, character actors and film stars. But amid these faces one finds other shapes, graven images of artifacts long lost, relics of the recent past. Two came to mind recently, objects long buried in the layers of the mind. One was a rubber shrunken head that hung from a light fixture in my grandparents' basement. It could have been my uncle's, from the time the room was his bedroom. At any rate, this shrunken head hung there above the bed until it was gone, imperceptibly, some decades ago. My theory is that my aunt may have objected to it as being inappropriate for my younger cousins. The head, as well as an even more problematic hanging object, (which I will soon describe) may have been guilty of some indiscretion, which all the other hundreds of other objects avoided committing—they did not disappear, but were permitted to stay in these basement rooms of mystery until quite recently. As with the real tsantsas (the original, ethnological artifacts made by the Jivaro Indians of the Amazon), this rubber shrunken head held some power: the power of hot rod zeitgeist, circa 1960. It was a standard mirror ornament of that era, very much a part of pop culture, and the whole muscular, adolescent spirit of America, which Big Daddy Ed Roth helped create with his monsters and customized car designs. It was an essence of Id, a gnarly, dirty, anarchic look. Nor Winky Dolls! 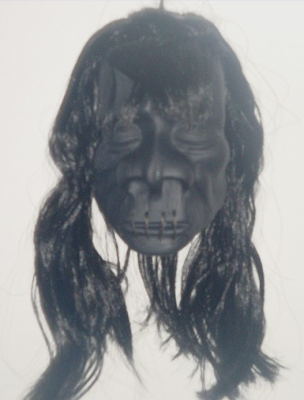 Just now I learned what it was called, the plastic doll, which hung alongside the shrunken head. Compared with the head, it was at first hard to find in Google (How do you do a google search for a nameless thing?) Finally, after digging through key words, I finally saw an image that resembled the vague memory I had. Yes, it did have those bowed arms and cartoony features. And those winking eyes, made with that fresnel plastic. It must have been acquired at the same time as the shrunken head, as research reveals that it emerged around 1960, a brief fad from Japan. 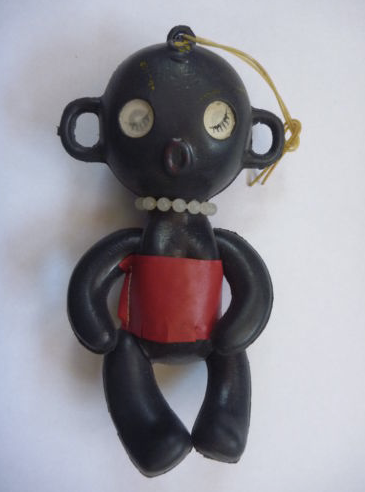 Gosh, these objects (not just this Winky Doll, but many such things emerging around 1960) are interesting! They're so weird and expressive. They show a world of great foment and imagination. Do we still have this imagination?